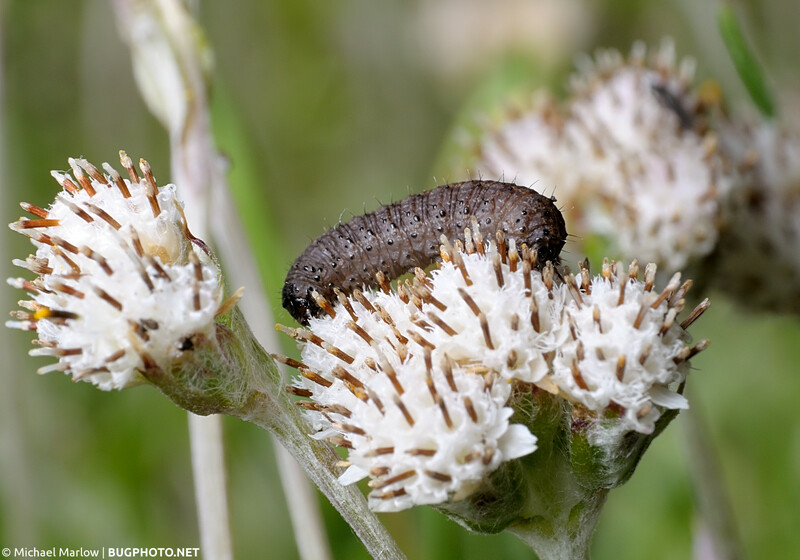 A grubby, brown caterpillar resting on a weed flower. Well, I finally had it with the old website design. It was a customized theme that I put entirely too much time into, and ultimately was bored with it as much as anything. One provoking facet more substantial than boredom that brought me here, was a desire to get back to a white background. My site originally started out on white, but I moved to a dark grey background with my customized site. I guess I just like the brightness factor, so I’m back to white, for now. So that’s where we are. If anyone has any feedback about the new theme, please, please, please let me know what you think in the comments. I also plan on adding a GALLERIES option to the main menu, which will link to galleries (duh) divided into meaningful groups; photos included will also be what I consider the best of what I have shared on BugPhoto.net and won’t just be glorified “Categories” pages. Hopefully, I will be able to tweak the new theme a bit this weekend in between shooting copious amounts of photographs. Cheers, everyone. Posted in MothsTagged caterpillar, grubby, Macro Photography, nondescript, photo blog, pictorico, white, wordpress themeBookmark the permalink. Nice design, I prefer black to show off photos but its taste. I think I prefer the white…can’t tell you why though.